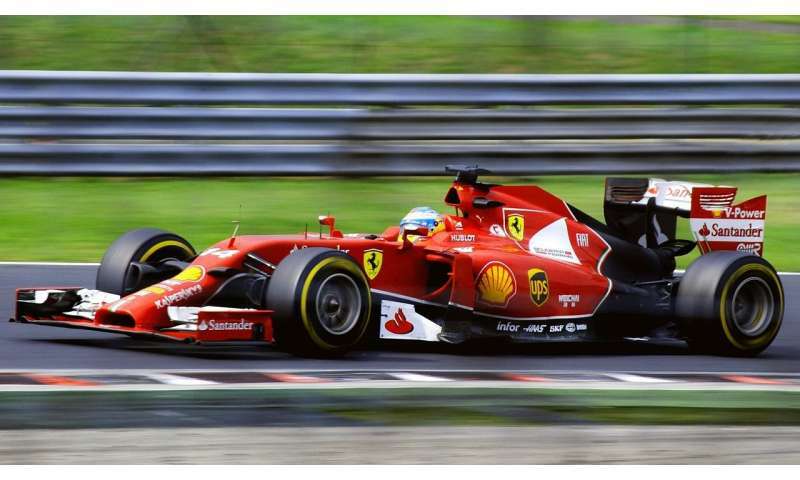 A team of researchers with Korea Advanced Institute of Science and Technology, the U.S. Treasury and the European School of Management and Technology has found via data analysis that Formula 1 race car drivers are more likely to crash if they are racing against an opponent who is similar in age and driving prowess when driving under safe conditions. In their paper published in the Proceedings of the National Academy of Sciences, the group describes their study of racing data and what they learned about race car driver behavior under escalating competitive conditions. Race car driving is an intense sport—drivers push their cars in excess of 200 mph while competing against other skilled drivers, which, despite recent technology advances, still represents quite a risk—drivers are still killed in wrecks sometimes. But the researchers wanted to determine the factors that lead to actual crashes. To find out, they obtained Formula 1 racing data for the years 1970 to 2014, which covered 732 races and 355 drivers, and analyzed it looking for patterns. One pattern is the heightened risk of a crash during good weather when drivers are similar in age and stature (when both are considered to have similar driving skills as noted by their ranking). A notable example would be the rivalry between Lewis Hamilton and Nico Rosberg—despite being teammates, the two have managed to rack up an impressive number of collisions, often with one another. The work was based on what those in the social sciences describe as the structural equiveillance theory—in which those with similar characteristics engage in heightened competitive conflict. An extreme example, they note, would be Mike Tyson biting off Evander Holyfield's ear in the middle of a highly promoted bout. When such behavior is present in racing, the end result can often be a collision as drivers make increasingly risky moves in attempting to best an opponent. But interestingly, they found, only when the weather is good, offering safe driving conditions. Presumably, all of the drivers on a course in poor weather are much more focused on avoiding a weather-related crash. This article investigates the factors that escalate competition into dangerous conflict. Recent sociological theorizing claims that such escalations are particularly likely in dyads of structurally equivalent people (i.e., actors who have the same relations with the same third parties). Using panel data on Formula One races from 1970 through 2014, we model the probability that two drivers collide on the racetrack (an observable trace of conflict) as a function of their structural equivalence in a dynamic network of competitive relationships. Our main hypothesis, that the likelihood of conflict rises with structural equivalence, receives empirical support. Our findings also show that the positive association between structural equivalence and conflict is neither merely a matter of contention for official position nor an artifact of inherently hostile parties spatially exposed to each other. Our analyses further reveal that this positive association is concentrated in a number of theoretically predictable conditions: among age-similar dyads, among stronger performers, in stable competitive networks, and in safe, rather than dangerous, weather conditions. Implications for future research on conflict, networks, and tournaments are discussed. A notable example would be the rivalry between Lewis Hamilton and Nico Rosberg—despite being teammates, the two have managed to rack up an impressive number of collisions, often with one another. Teams also tend to employ drivers of the same stature because their cars are built to accomodate them. This is the dumbest article I've seen on here in a long time. Whoever paid for this study would have saved themselves time by just tossing the money in the nearest trash can because that's about all this article is. Do scientists really have to do a study for something that most people would simply call common sense? Those cars are all basically the same go-kart with different bodies placed on them these days. Same thing in Nascar. The only real difference is just how daring and crazy the individual drivers are willing to be in order to win the race. Those cars are all basically the same go-kart with different bodies placed on them these days. I disagree. Read the rules on those cars. There is actually very little that can be different from any other car. If it wasn't for the paint jobs they would all look almost identical barring slight differences in wing shapes and even then they have multiple rules about what shape they can be. It seems like racing is a bad place to start for this study. If there was ever an issue with drivers of unequal skill sets crashing it was deliberately removed from the sport. The researchers are looking at deliberately grown DNA of an entertainment event to find natural order of human interaction. It seems a little iffy. Rules for letting faster cars proceed exist. The sport is active in limiting the slower drivers opportunity to degrade the competition at the front of a race. So the dataset is going to lean towards what the research found by design of the sport itself. Rules for limiting the field to only those that actually have a chance to stay close and potentially crash are the foundation of most racing. To make any conclusions about competition escalating to conflict, when the sport is actively encouraging athletes to be at the edge of that threshold. It seems like a bad sport to base the research on to begin with. I disagree. Read the rules on those cars. I repeat, read the rules which you obviously haven't done. What they used to be able to do means nothing. It's what they can do now.